Paperback, 4.25 x 6 in. / 160 pgs / 83 bw. A gift book for anyone who loved The Moon or Hippie Modernism. It's a very funny and accessible visual essay that assembles historical, present-day, and speculative material, combined with fictional and factual stories to create a loving spoof of 1960s and 1970s eco-utopianism. ABOUT THE AUTHOR: Author Fabian Reimann had a great success with his Another Earth Catalog published in 2012 with Spector, which was an take off on Whole Earth Catalog by Stewart Brand. This new book again returns to Stewart Brand, this time his publications on the topic of colonizing space. He is also a artist working in Leipzig and editor of the "ego-zine" Freeman's Journal (since 2004). PROMOTION, PRESS: Beloved on Social media. At the beginning of the 1970s, American physicist Gerard K. O’Neill developed the first ideas for colonizing space. Shortly thereafter, Stewart Brand, cyber-communard and editor of the Whole Earth Catalog, took up these ideas and published the book Space Colonies in 1977. 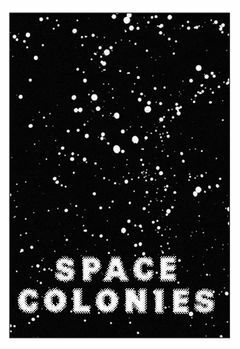 Space Colonies, an edition of Brand’s CoEvolution Quarterly, funded by the proceeds of the Whole Earth Catalog, took up the question of whether space might be colonized by the year 2000. Artist Fabian Reimann takes up Brand and O’Neill’s particular strain of techno-utopianism in Space Colonies: A Galactic Freeman’s Journal. In his photo-essay Reimann assembles historical, present-day and speculative material, combining these with fictional and factual stories to create a composite of different images of the world. With global ecological disaster an even more pressing issue than it was in 1977, and the colonization of space still touted by some as a last-ditch resort, Reimann looks back at the dreams and nightmares of the 1970s with a sophisticated visual humor. Fabian Reimann (born 1975) is an artist working in Leipzig and, since 2004, the editor of the “ego-zine” Freeman’s Journal. His Another Earth Catalog, which refers back to Stewart Brand’s Whole Earth Catalog, was published by Spector Books in 2012. Reimann works with sculpture, photography, collage, painting and text in extended research projects that blend history and science, and fact and fiction. FORMAT: Pbk, 4.25 x 6 in. / 160 pgs / 83 b&w.